Preheat oven to 190 degrees C. Prepare 12 muffin cups or line your muffin tray with liners. In a large bowl whisk all the wet ingredients gently till fully mixed. Place aside. In another large bowl, sift the flour then whisk in all the dry ingredients. Tear the cheese pieces into 2-3cm sizes and drop them into the mixture. Gently stir in the cheese pieces such that they are evenly spread throughout the dry mixture. Slowly pour the wet ingredients into the dry ingredients and using a spatula, gently fold the wet ingredients into the dry ingredients until the dry ingredients are sufficiently moistened. It should take about 15 -20 strokes. Do not over mix the batter as the muffins will become very tough. The batter will be thick and lumpy. Scoop the batter into muffin cups and top each with 2-3 small pieces of sliced cheese again before u put them into the oven. Bake for about 15 - 20 min or until u smell the aroma of the baked muffins. Mine was done around 18min. The toothpick test doesn't work as the melted cheese within the batter would be sticky. 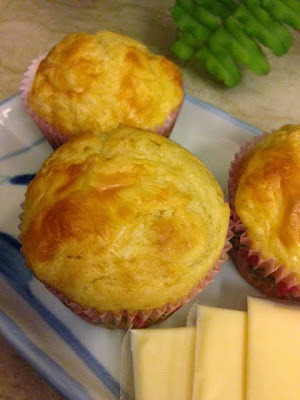 Cool the muffins for about 10 min before consuming as the cheese would be very hot. Occurrence of hair damage Kerave Hair is guaranteed whether or not you subject your hair to it. Hair damage is a natural process. If you do not take care of your hair damage, it may result into more damage as compared to those who do take care.